I bought my first cast-iron skillet as a fledgling baker in high school, looking for a proper vessel for making pineapple upside-down cake. It was actually a completely uneducated buy; I was at the late, lamented Lakewood Antiques Show, saw a wonderful, smooth 9" cast-iron skillet for $18, and talked them down to $12 (it was a Sunday, the last day of the show, after all). I didn't know anything about seasoning the pan, and I bought it in part because, frankly, I didn't know that new cast-iron pans were still manufactured. 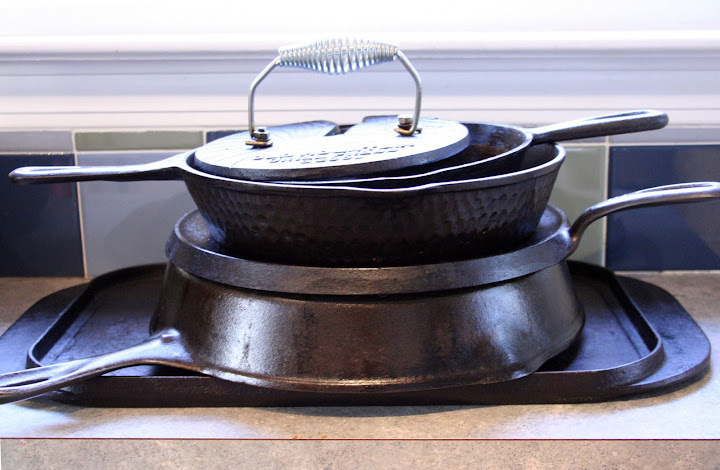 It's turned out to be well worth its $12 price, and sits permanently on top of our stove, stacked with a number of other cast-iron pans that could double as anti-burglary implements, if it ever came to that. 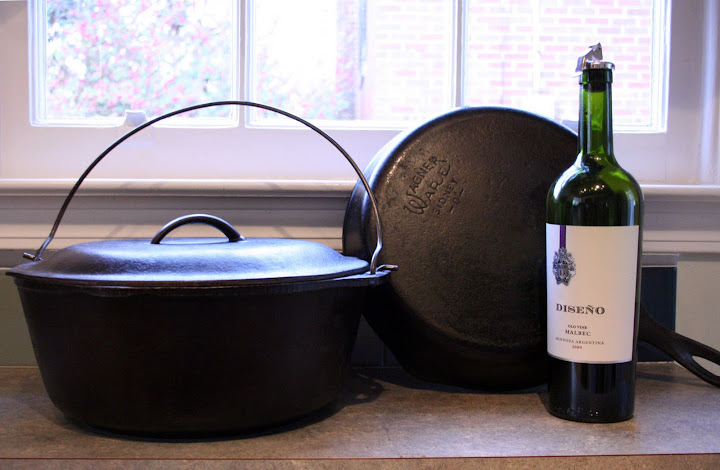 There are several ways you can buy cast-iron: new and unseasoned, new and pre-seasoned by the manufacturer, used and in good shape, and used and in rusty, messy, rough shape. I prefer old Griswold and Wagner pans; if they're well used and well seasoned, they tend to have lost the roughness that comes from their original manufacture, wherein they're cast in sand molds. One of my favorite pans - a 12" skillet that we use for almost every dinner - came from my Grandmama; she'd had it forever but rarely used it because it was so heavy. It's perfectly smooth from years of use by my Grandaddy. Another - an 8-quart Dutch oven - came from my Grandpa, redundant with an even bigger Dutch oven that he uses for gumbo. It's perfect for gumbos, stews, and coq au vin. The others I've purchased on eBay or bought new. Although a few of my pans have specific uses - a Griswold skillet won on eBay for $40 (a decent price for a great pan) was purchased as a crepe pan, and while it's perfect for that, it's also used every other day for grilling sandwiches or making fried eggs. The point is, I tend to use cast-iron as my everyday, go-to cookware; other cooks use it mainly for browning, or frying (since it retains heat so well). You'll pay about $25 for a new, pre-seasoned 12" skillet, $25 to $60 for an old Griswold or Wagner pan (because collectors love these, and they really are great pans), and as little as $10 for an old pan that needs a lot of elbow grease. You can sometimes find them at yard sales for even less. If you're out to buy a new pan, Lodge's pre-seasoned line, Lodge Logic, is America's Test Kitchen's top pick, and they're available on Amazon and in every neighborhood hardware store near me. The 12-inch skillet is a versatile pan that's great for browning meat and making cornbread. Cast iron is great for cheap electric stoves like ours because it distributes heat evenly, making up for hot spots on the stove. It's also great for browning and frying - its mass retains heat well, so it's relatively easy to keep oil at a steady 350 degrees. Cast iron cookware is also ideal for stove-to-oven cooking, as in the case of pineapple-upside down cake. A well seasoned pan has a natural non-stick finish, and if a pan, through misuse or lots of acidic foods, loses its seasoning, reseasoning is a relatively easy process. 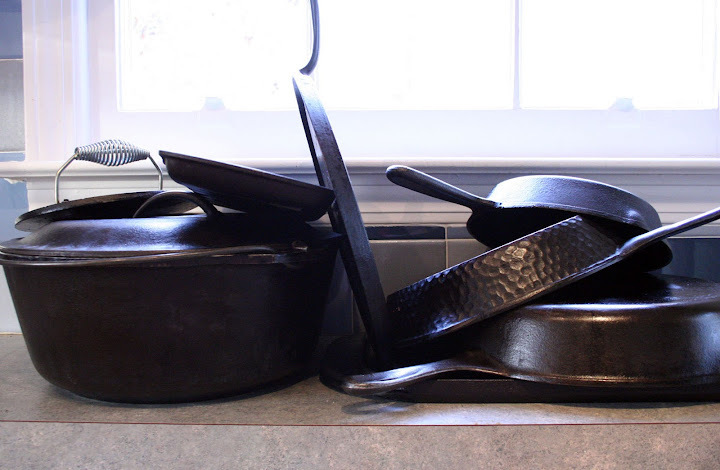 A cast iron pan can easily last a lifetime or longer, as so many regularly used antique pans can attest. To save an old pan, you're going to have to give it a good cleaning (use soap, just this once, and maybe a little sandpaper or steel wool), and season it, just as you might with a new pan. "Seasoning" is simply the process of working oil into the pores and minute crevices of the iron, and there are many ways to do it. I generally heat the oven to 450 degrees, and rub a small amount of vegetable oil into the pan. Heat the pan in the hot oven for 30 minutes, then turn off the oven and let it cool. While the pan is still a little warm, work the fat into the pan again, burnishing and rubbing. Repeat two or three times. Get a good seasoning, treat your pan well, and you'll rarely have to do it again. Don't use soap to clean your seasoned pan. Using very hot water, scrub the pan with a brush to remove all food, and run the hot water over the pan long enough to sanitize it, about 30 to 60 seconds or so. Wipe dry before putting the pan away. Every third use or so, I spray a little oil onto the cooking surface and rub it in with a paper towel. A pan may get gummy after a lot of use. In the case of a rusty or gummy pan, America's Test Kitchen recommends that you pour in vegetable oil to a depth of 1/4 inch, and heat it over medium-low for 5 minutes. Remove from heat and add a quarter-cup of kosher salt. Use a thick wad of paper towels to rub the bottom of the pan, then clean as usual. Of course, there's a whole other class of cast-iron - the enameled stuff - that includes Le Creuset and beautiful Staub. Since I don't have any experience with those, I'm going to leave that alone for now. And finally, here are some good articles on cast iron. I love, love, love cast iron. I keep my 9" skillet on the stove all the time too since it's in use pretty much every day. My skillet would be my favorite since I use it the most, but my cast iron corn bread muffin pans do an excellent job too. Hello, my name is Jessica and I don't have ANY cast iron cookware. It's been on my mind, where do I start? I know the 9/12" inch skillets are the standard and most versatile. But I feel like the times I'm really wishing I had one is when I want to make pancakes or grill - so I have this (http://www.amazon.com/gp/product/B002CMLTXG/ref=ord_cart_shr?ie=UTF8&m=ATVPDKIKX0DER) in my Amazon cart. Should I start with both? Is there a smaller double sided griddle I don't know about? I use my cast iron most everyday! Great pan. I always recommend it to new cooks. Amazing results on my gas stove too! Thanks for sharing all the good info. Jess, you have to get one! 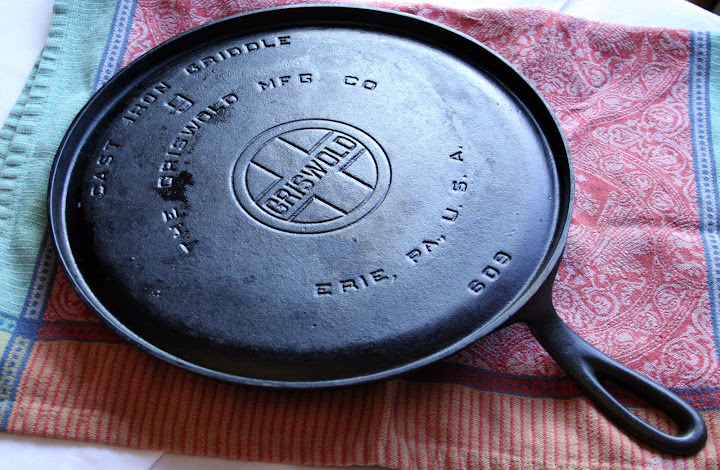 If you're looking for a griddle-type pan, I'd start with one like my Griswold. I have a big flat griddle, too, but the smaller round pan is great for a small kitchen, to keep out all the time. And it really makes perfect crepes. We'll look for one at Brimfield in just a couple of months! "I was at the late, lamented Lakewood Antiques Show . . ."
Is that the place we all bought fake ID's? I see now: my mistake was using dishwasher soap on my cast-iron pan. Thank you so much for this lesson, I mean - the whole post. As usual, you make complicated things simple and systematize otherwise fractured blobs of information. It's a pleasure to read you, Elizabeth. What a nice thing to say! I really appreciate the comment. As for your cast-iron - don't worry; all's not lost. Just re-season it and keep the dish soap far, far away from now on. Do you mean novelty ID's? No, I don't think it was - those novelty ID's were from a now-defunct market in Little Five, I think. Lakewood was classy. My husband and I finally bought a cast iron pan a few years ago after years of flaking teflon, and we will never go back. He refers to it as his 'man pan' and loves to use it. I hadn't thought about searching for older pans, but now I will be on the look-out during my thrifting rounds. I love cast iron as well and just purchased my first piece. It has the same finish as only one of yours. Can you tell me anything about it. The one with the "hammered" look. Unfortunately I don't know much more about my "hammered"-looking pan than what I've said here, but I love it. It's got a unique look, and it's perfectly smooth on the inside.